"Once one starts thinking about [actions to accelerate economic growth], it is hard to think about anything else." A striking observation made by Nobel Laureate in Economics Robert E. Lucas (Feb 15, 2011). 'Historically nothing has worked better than economic growth in enabling societies to improve the life chances of their members, including those at the very bottom.' Dani Rodrik (2007), Harvard University. In the world of economic discourse and reporting, economic growth is the measure against which everything else in its large orbit is judged. An economy that is not growing enough is described as facing some sort of temporary "headwinds".You can be sure that economists, industry leaders, and the government are fast at work on the "recovery" that will bring things back to "normal." In many countries, elections are won or lost over who has the best-sounding plan to keep the economy growing. 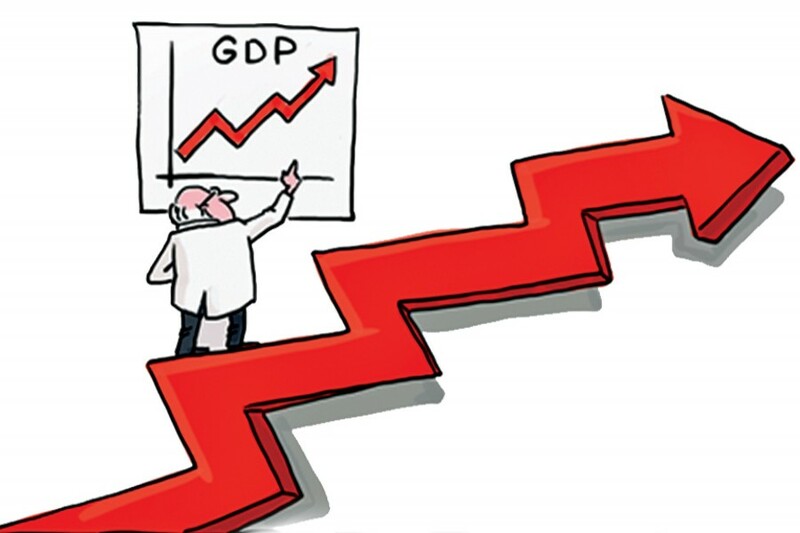 Economic growth measures positive change in the Gross Domestic Product (GDP). Putting this plainly, a growing economy is one in which there are more goods and services being bought and sold. This simply means that in aggregate there are more cars being sold, haircuts being given, hamburgers eaten, vacations taken, houses and TVs bought, roads built, Netflix subscriptions made, and you get the point. Economists are often accused of being too single-minded on GDP. They are exhorted to focus on families and communities, on helping people, even though these may not necessarily add to the GDP. Notwithstanding these complaints, the perceived benefits of economic growth far outweigh its downside. Some of us surely have far more than we need, and certainly would be just fine if next year we have the same amount as we do now. But there are plenty of people who don't have enough of even the basics. To redistribute our current flow of income and the stock of wealth would cause untold political problems, help bridge the inequality gap only up to certain point while risking lowering the incentive for both business and innovation. Increasing the size of the economy does not makes closing the inequality gap relatively easier. Far more people are willing to support the growing of the metaphorical pie that we split than an outright resetting of the current pie into smaller pieces. This is what motivates the understanding of the growth process. This year's Nobel prize is the fourth time it has gone to economists for their pathbreaking work on growth. Theyaddress some of the most fundamental and pressing contemporary issues: long-run sustainable growth in the global economy and the security of our planet. Let's take a tour of this one of the most fascinating areas of economic theory focusing especially, but not exclusively, on the work of 2018 Nobel laureates. Further, in late 19th and 20th centuries, Karl Marx presented a theory of historical growth and Schumpeter developed a growth theory of technological innovations. Following the Keynesian Revolution in late 1930s, R. F. Harrod and E. Domar presented a theory of economic growth popularly known as Harrod-Domar theory. The neo-classical theory of growth followed almost as a response to the Harrod-Domar propositions. At the same time, the breakdown of the colonial system in Asia and Africa led the creation many new countries, some of which occupied strategic locations, others possessed significant natural resources, and most of which were desperately poor. Economists inquisitive about the vast landscape of underdevelopment of these countries developed a variety of analytical frames that have come to be known as the structuralists models of development pioneered by Sir Arthus Lewis. These set the stage for the path breaking work done by Douglas North, Paul M. Romer and William D. Nordhaus, all worthy recipients of Nobel Prize in economics. Capital accumulation, stability and growth: Harrod-Domar extended Keynes' short-term analysis of the determination of income and employment in a market economy. They constructed a long-term theory of output, paying attention toward economic stability after the Great Depression of 1930s and economic ruin caused by World War II. They focused on the conditions for steady economic growth, identifying capital accumulation as a major factor for the growth of an economy. Capital accumulation not only generates income, but also increases the production capacity of the economy. If a plant is constructed, it would generate income for suppliers of different materials, such as cement, bricks, steel, and machinery with simultaneous increase in capital and production capacity of the economy.The newly generated income from capital accumulation produces demand for goods and services. The demand created due to newly generated income should be sufficient, so that the output produced by the increase in capital is fully absorbed.If the output is not fully absorbed, there would be excess or idle production capacity. This condition must be satisfied consecutively to maintain full employment level and achieve steady economic growth in the long term. Unfortunately, noted Harrod-Domar, there is no guarantee that such a condition will be automatically met. It is possible that such a precise equilibrium will be reached. But if it does not, the economy could tumble into a catastrophe. There is a precise rate of investment which is compatible with full employment, but markets do not guarantee achieving it automatically. Aggregate demand must grow at the same rate as the growth in the economy's production capacity. This gave rise to the (in)famous Harrodian "knife-edge": if demand growth is slower than capacity growth, excess capacity will result, driving firms to invest less which in turn reduces demand growth through a multiplier process, thus exacerbating excess capacity. This could lead to "secular stagnation". Conversely, if demand growth exceeds capacity growth, insufficient capacity would induce entrepreneurs to invest more, leading to further increases in demand. The economy then will either grow or collapse indefinitely. The "knife-edge" thus means that the steady state growth path is "unstable": the only stable growth path is where the actual growth rate equals the saving rate divided by the capital-output ratio permanently. Any deviation from this path does not gravitate back but moves further away from it. Harrod introduced the concepts of warranted growth, natural growth, and actual growth. The warranted growth rate is the growth rate at which all saving is absorbed into investment. If, for example, people save 10 percent of their income, and the economy's ratio of capital to output is 4, the economy's warranted growth rate is 2.5 percent (10 divided by 4). This is the growth rate at which the ratio of capital to output would stay constant.The natural growth rate is the rate required to maintain full employment. If the labor force grows at 2 percent per year, then to maintain full employment, the economy's annual growth rate must be 2 percent (assuming no growth in productivity). Actual growth is determined by the rate of saving and natural growth is determined by the growth of the labor force. There is no necessary reason for actual growth to equal natural growth, and therefore the economy had no inherent tendency to reach full employment. Harrod assumed that the wage rate is fixed and that the economy must use labor and capital in fixed proportions. This implied unstable growth. If companies adjusted investment according to what they expected about future demand, and the anticipated demand was forthcoming, warranted growth would equal actual growth. But if actual demand exceeded anticipated demand, they would have underinvested and would respond by investing further. This investment, however, would itself cause growth to rise, requiring even further investment leading to explosive growth. The same story can be told in reverse if actual demand should fall short of anticipated demand. The result then would be a deceleration of growth. Harrod did get economists to start thinking about the causes of growth as carefully as they had thought about other issues, and that is his greatest contribution to the field. Harrod-Domar used production functions with little substitutability among the inputs to argue that the capitalist system is inherently unstable. They offered a model of long-term economic growth ignoring substitution of factors of production and, therefore, possessed a "knife-edge" property in which any step away from the warranted rate of growth led inexorably to collision with a full employment ceiling or to mass unemployment and depression. Robert Solow (1956), arguing that we should not ignore substitution in the long run, changed Harrod' sproduction function from a fixed-factors to a flexible-factors form and showed that the flexible price system would align the warranted rate of growth with the natural rate of growth,given by the growth of population and technology, and guarantee that deviations of the warranted from the natural rate would be self-correcting. Far from being balanced on a knife edge, long-term growth is stable. The neoclassical research set the foundations of modern economic growth theory, known as the exogenous growth models. In these models with no technological progress, the diminishing returns cause the economic growth to slow down and eventually stop. The factor that determined the continuous growth of economies is a productivity parameter, which is assumed to grow at a constant and exogenous rate. This simple model revealed some valuable features of the growth process, such as that the technological progress is one of the main factors affecting growth. A sustained rise in capital investment increases the growth rate only temporarily: because the ratio of capital to laborincreases. However, the marginal product of additional units of capital decline, thus moving the economy back to a long-term growth path, with real GDP growing at the same rate as the growth of the workforce plus a factor to reflect improving productivity.A 'steady-state growth path' is reached when output, capital and labor are all growing at the same rate, so output per worker and capital per worker are constant.Raising the trend rate of growth requires an increase in the labor supply plus a higher level of productivity of labor and capital.Differences in the pace of technological change between countries can explain much of the variation in growth rates observed. Given the same technology across countries, the Solow model predicts poorer country catching up with a richer country because of higher marginal rate of return on invested capital in poorer economies. There must be some convergence of living standards (measured by per capita incomes). Convergence may not happen because of differences in productivity improvements which happen exogenously i. e. independent of the amount of capital investment. Dual economies: A parallel set of research on growth or its obverse stagnation, motivated by the post-World War II breakdown of the colonial system leading to the emergence of many poor nations, have come to be known as dual economy or structural models. The traditional dual economy articulation is due to the seminal work of Sir Arthus Lewis' (1954)which analyzes the long-run development of an economy with two specific sectors, a large agricultural and an industrial or modern one, exploring the path through which a poor economy does convert itself into an industrial one. The agricultural sector is characterized by abundant endowments of labor and land. Given the unlimited labour supply at the subsistence wage, the marginal product of labor in this sector is very low (if not zero or negative), producing an unlimited supply of labor at the level of subsistence wage for a considerable period. On the other side, there exists an industrial sector, in which the institutionally fixed wage is at a level higher than the one in the rural sector. Since at subsistence level there is a large excess labor supply, the capitalists in the industrial sector do not have to worry about wage pressures when deciding the number of workers to employ. Further it is assumed that only capitalists in the industrial sector save, while agricultural and urban workers do not. Lewis argued that the central process of development consists of moving a large mass of underemployed workers, with low productivity, out of a "subsistence" sector, where living standards are necessarily low, into a modern "capitalist" sector, where output per worker can be higher because it is "fructified by capital". In this framework, growth consists, in its simplest form, of expanding the capitalist sector. This expansion requires an increase in savings, which can only come from the capitalist sector or from external sources. As capital flows into the economy, it is used to create jobs in the modern sector, which in turn can always be filled by workers from the subsistence sector. As these workers move, the savings rate of the economy rises, leading to a virtuous circle that steadily raises the level of income per worker. Many authors have sought to formalize the Lewis model and to identify a set of assumptions or rigidities that will deliver a version of the Lewis dualism. Many of the specific assumptions and mechanisms of the Lewis model have not been well supported by contemporary theory and evidence. This calls into question efforts to use the Lewis model in a very literal fashion for policy analysis. The model remains a powerful tool for thinking about growth because it correctly identifies a key feature of the growth process-the importance of within-country gaps in income and productivity, or dualism. Lewis made the incisive observation that poor countries are not uniformly poor and that even the poorest countries have firms, sectors, and areas that operate at high levels of productivity. Lewis was less convincing in explaining why these islands remain and why the within-country gaps are not eliminated through migration and factor mobility. But his framing of the question compelling. The basic idea of dualism remains ubiquitous in the development and growth literature today, although it is difficult to pin down in data. Large numbers of people in poor countries work in quasi-subsistence agriculture and in very low-productivity informal services. Development must surely involve both a movement of people (and resources) across the dualistic divide and a reduction of the barriers and obstacles that lead to dualism. This central insight of Lewis seems entirely valid today. A key theme in the Lewis model-perhaps the most important feature of the model-is the importance of capital investment as a source of growth. Capital represents a fixed factor in the short run for most developing countries. There simply is not enough capital to absorb all of the economy's labour in the modern sector. Lewis's thinking was heavily informed by the Harrod-Domar model and the other planning-oriented growth theories of his day. A major focus of these works is how to mobilize sufficient capital for an economy to grow and how to allocate it across sectors to achieve certain planning goals, assuming different values of the incremental capital output ratio for different sectors and different economies. The "surplus labor" paper that spells out the Lewis model is also the source of the famous quotation that "[t]he central problem in the theory of economic development is to understand the process by which a community which was previously saving and investing 4 or 5 per cent of its national income or less, converts itself into an economy where voluntary saving is running at about 12 to 15 per cent of national income or more. This is the central problem because the central fact of economic development is rapid capital accumulation (including knowledge and skills with capital). "An important corollary of capital as the key source of growth in labor surplus economies was that foreign assistance and other forms of foreign capital inflows could play a central role in driving development. Economies could not and would not indefinitely have unlimited supplies of labor to the capitalist sector at a wage determined by equilibrium in a subsistence sector. At some point, if population growth does not outpace the accumulation of capital, sufficient labor would be pulled out of the subsistence sector to drive wages upwards by a rising marginal product of labor. For Lewis and his subsequent expositors, thismoment represents a turning point. Until that moment, the capitalist sector canexpand with fixed wages; beyond that moment, expansion of the capitalist sectorwill come in a context of rising wages. In retrospect, the emphasis on capital as a source of growth seems to have overlooked the importance of productivity growth, and the assumption that only capitalists can invest productively is inconsistent with current micro and macro evidence on savings behavior and investment. A standard Solow-style model with growth in the labor force allows for economic growth through accumulation of factors. The specific prediction of Lewis-style growth before the turning point is that wages in the capitalist sector will remain approximately flat during a potentially protracted period of growth. Indeed, a specific prediction of the Lewis model is that with flat wages and a growing capitalist sector, the economy-wide share of capital should be rising until the turning point. In modern parlance, this is a claim about factor shares. Lewis argues that poor countries with surplus labor should see the capital share rise and the labor share of income fall. Structural transformation models have become deeply embedded in contemporary thinking about development and growth because they seem to capture a key reality of the development process. Their stylized description of a dualistic economy rings true with anyone who has spent time in a poor developing country, where modern glass buildings and shiny downtown areas coexist with huge populations of farmers scratching the soil with hand tools. Focusing on this fundamental dualism is a useful way to think about the development process. Structural transformation processes have captured renewed attention in contemporary discourse on development. There is abundant empirical support for the proposition that structural transformation does, in an accounting sense, explain a large fraction of growth and income levels. Recent literature does provide evidence that misallocations across sectors-and even across firms within sectors-may play an important role in explaining aggregate income differences and productivity differences across countries. Dualistic models provoke a set of research questions that were perhaps neglected for too long in the development and growth literatures. Both academic economics and the world of development policy were arguably hurt by the relative neglect of dual economy models for several decades, beginning in the mid-1960s. The long dominance of one-sector models in the growth literature meant that questions of importance to developing countries were not really addressed. The issues that stand out today are related to the sources of dualism. We need to learn more about the kinds of frictions and barriers that prevent the movement of labor across sectors. These barriers may reside in labour markets, or they may be related to frictions in markets for land and capital. We also need to understand better the reasons why productivity differs so markedly across sectors. Technological change: The predictions of the single and multi-sector exogenous growth models motivated the new theoretical and empirical efforts from which emerged the endogenous growth models during the 1980s. Paul Romer in 1986 floated the idea of endogenous growth, followed by Aghion, Howitt and others. These models introduced research and development and the human capital as explanations of technological change. The accumulation of ideas and human capital is what drives the technological changes. This work distinguishes itself from neoclassical growth by emphasizing that economic growth is an endogenous outcome of an economic system, not the result of forces that impinge from outside. The theoretical work does not invoke exogenous technological change to explain why income per capita has increased by an order of magnitude since the industrial revolution. The empirical work does not settle for measuring a growth accounting residual that grows at different rates in different countries. Instead it tries to uncover the private and public-sector choices that cause the rate of growth of the residual, commonly known as total factor productivity (TFP), to vary across countries. As in neoclassical growth theory, the focus in endogenous growth is on the behavior of the economy. This body of work is complementary to, but different from, the study of research and development or productivity at the level of the industry or firm. One of the central questions in development, that the traditional neoclassical model struggles to come to grips with, is: why is it that the poor countries as a group are not catching up with the rich countries in the same way that, for example, the low-income states in the United States have been catching up with the high-income states? Both Robert Lucas (1988) and Romer (1986) cited the failure of cross-country convergence to motivate models of growth that drop the two central assumptions of the neoclassical model: that technological change is exogenous and that the same technological opportunities are available in all countries of the world. Ideas are non-rivalrous. Discoveries differ from other inputs in the sense that many people can use them at the same time. Physical and human capital are rival goods. A machine, or a trained engineer, used in one factory cannot be used at the same time in another factory. Ideas, on the other hand, are non-rival: one person or firm using an idea does not preclude others from using it too. In the language of public finance, ordinary goods are rival goods, but information is non-rival. Doubling all rivalrous inputs should allow a doubling of output. There is no need to double the non-rival inputs because the existing pieces of information can be used in both instances of the productive activity at the same time. Technological advance comes from things that people do. Discovery at the individual level seem to be an exogenous event in the sense that forces outside of one's control mostly determine success. But the aggregate rate of discovery is endogenous. When more people start prospecting for some precious resource such as gold or experimenting with scientific ideas, more valuable discoveries will be found. This will be true even if discoveries are accidental side effects of some other activity (finding gold as a side effect of ditch-digging) or if market incentives play no role in encouraging the activity (as when discoveries about basic HYV seeds in Bangladesh were induced by government research grants). The aggregate rate of discovery is still determined by things that people do. Increasing returns to ideas. The production of new goods, which are based on ideas, usually has rapidly declining costs: the first blueprint has a large fixed cost, but replication has small marginal costs. Growth driven by the accumulation of ideas, unlike growth driven by the accumulation of physical capital, does not have to experience decreasing returns. In other words, ideas-driven growth can be sustained over time. Many individuals and firms have market power and earn monopoly rents on discoveries. Even though the information from discoveries is non-rival, economically important discoveries usually do not meet the other criterion for a public good; they typically are partially excludable, or excludable for at least some period if institutions or regulations make it possible to prevent someone from using them. For some ideas, such as results from basic research, this is difficult or even impossible (the Pythagorean Theorem for instance). For other ideas, however, users can be excluded through technical measures such as encryption or patent laws. Because people and firms have some control over the information produced by most discoveries, it cannot be treated as a pure public good. If a firm can control access to a discovery, it can charge a price that is higher than zero. It therefore earns monopoly profits because information has no opportunity cost. The neoclassical model developed and applied by Robert Solow (1956, 1967) and others constituted a giant first step forward in the process of constructing a formal model of growth. Like any model, the neoclassical model is a compromise between what we would like from a model and what is feasible given the state of our modeling skills. The neoclassical model captured competition but postponed consideration of increasing returns and market power. From a theoretical point of view, a key advantage of the model is its treatment of technology as a pure public good. This makes it possible to accommodate knowledge as a non-rival good in a model that retains the simplicity of perfect competition. The public good assumption also implies that knowledge is non-excludable and this is clearly inconsistent with the evidence that individuals and firms earn profits from their discoveries. This assumption was useful, nevertheless, as part of an interim modeling strategy that was adopted until models with non-rivalry and excludability could be formulated. Endogenous growth models took the next step and accommodated non-rivalry of knowledge with excludability enabled by market power. For years, the economic analysis of science and technology policy was based on the premise that the government should provide public goods and the private sector should provide private goods. Basic research is a public good and applied research is a private good. The first premise turns out to be misleading because it under-states the possible role for collective action. Governments can usefully provide goods that are non-rival but are not truly public goods, because they are potentially excludable. On the other hand, applied research is not an ordinary private good. Romer's work took the discussion outside of the simple dichotomy between public and private goods by paying more attention to the distinction between the two different aspects of publicness (non-rivalry and non-excludability) and looked more formally at the different kinds of policy challenges that non-rivalry and non-excludability present. Following Arrow (1962), a breakthrough in this research is the emphasis on private sector activities that contribute to technological advance rather than public sector funding for research. A subset of these models is sometimes referred to as neo- Schumpeterian models because of Schumpeter's emphasis of the importance of temporary monopoly power as a motivating force in the innovative process. Growth theorists eventually had to abandon the assumption of price-taking competition. Even though it is obvious in retrospect that endogenous growth theory would have to introduce imperfect competition, this was not the direction that the first models of the 1980s pursued. Research on endogenous growth models in which monopoly profits motivate innovation has uncovered several unexpected connections between market size, international trade, and growth. The main points of the endogenous growth theory are as follows: improvements in productivity can be linked directly to a faster pace of innovation plus investment in human capital. Strong government and private sector institutions are needed to nurture innovation and provide incentives for individuals and businesses to be inventive.Government policies can raise a country's growth rate if they lead to more intense competition in markets and help to stimulate product and process innovation. There are increasing returns to scale from capital investment especially in infrastructure and investment in education, health and telecommunications. Investment in human capital (the quality of the labor force) is a key ingredient of growth. Private sector investment in research and development is a key source of technical progress. The protection of property rights and patents is essential in providing incentives for businesses and entrepreneurs to engage in research and development. Government policy should encourage entrepreneurship as a means of creating new businesses and ultimately as an important source of new jobs, investment and innovation. Romer showed that unregulated markets will produce technological change but tend to underprovide R&D and the new goods created by it. The new knowledge created by successful research and development can benefit entrepreneurs and innovators anywhere in the world at present or future. Assuming the new knowledge is socially beneficial, markets will fail to conduct the optimal R&D. Monopoly profits constitute market incentives for R&D, but this also implies inadequate provision of new goods once they have been invented. Addressing this under-provision requires well-designed government interventions, such as R&D subsidies and patent regulation. Such policies are vital to long-run growth, locally and globally. Patent laws should strike the right balance between the motivation to create new ideas, by giving some monopoly rights to developers, and the ability of others to use them, by limiting these rights in time and space. In the deluge of theoretical work on endogenous technological progress, it is generally assumed that the rate of technological progress at any date is linearly increasing in the research effort made at that date. This makes it logically possible to generate any number of inventions, no matter how large, in any period, no matter how short. This is grossly unrealistic. Critics have argued that the process by which new economically valuable ideas are generated in contemporary economies is characterized by important "congestion" externalities which yield diminishing returns in the research sector. Market outcomes may also entail too much R&D - either when new ideas kill off too many existing firms in a process of creative destruction, or when new ideas augment socially harmful technologies, such as by enabling excessive extraction or use of fossil fuels, thus harming the climate. Advocacy of the use of subsidies to encourage investment in research as a correction for market failure may be ignoring other market failures that would suggest a different course of action. Geography and institutions: In general, studies investigating the underlying determinants of cross-country income and growth differences can be grouped into three strands of theory. The first strand is neoclassical theory focusing on the factor accumulation (i.e. physical and human capital), structural rigidities producing dualistic economies and technological advances as determinants of economic performance, as discussed above. The second is the locational theory that argues geographical characteristics such as temperate climate and ease of access to markets are critically important for the achievement of high income levels and growth rates.Athird fascinating strand is the institutional theory, introduced by Douglas North (1990), advocating the primacy of institutionalquality as the deep determinant of per capita income levels and growthrates. Geography has received a lot of attention as a deep determinant of long run economic growth. The effects of geography on long-run economic growth are multifaceted. Health, population growth, food productivity, resources endowment and mobility of factors of production are all dependent on geography. These play important roles in affecting economic growth. Tropical climate is believed to have adverse effects on human health and agricultural productivity, resulting in lower levels of per capita income, while the positive effects of winter frost on agricultural productivity stimulate overall economic development. Colonies with adverse disease ecology (such as malaria and yellow fever), which caused a high death rate among European settlers, were subject to an extractive mode of colonial governance. As a result, these colonies tended to develop weaker institutions compared with institutions of those colonies that had offered favorable settlement conditions such as Canada and USA. A debate on the relative contributions of geography and institutions to economic growth and development has been waging for the past few years. The debate is not whether geography or institutions are individually important in stimulating growth. Rather, it is a debate on how important each of these factors is in the presence of the other in accounting for cross-country differences in per capita income. On the one side, there are scholars who argue that geography is important, but not as important as institutions. On the other side too, there are who counter with cross-country econometric evidence supporting the supremacy of geography. One can argue that unchanging geography can explain persistent patterns such as the hierarchy of incomes within the Americas or the sharp and longstanding differences between Europe and the Middle East. The same fact is also consistent with institutional explanations. More generally, geographic factors are not helpful in explaining the differences observed across different parts of the world in the past and at present. The complex, and often perverse, impact of natural resources on development exemplifies the difficulty in believing that geography is of utmost importance in determining economic growth. So long as we observe some countries with superior geography suffering from falling real income while others with poor geography are prospering, we must look beyond geography for a better explanation of long-run economic growth. Surely, superior geography, such as strategic location and abundant resources, helps spur economic growth, but it is neither necessary nor sufficient. North outlined a clear institutional framework based on a proper structuring of property rights. Contrasting the organization of production in less developed economies with that of advanced economies, North noted the consequences of poorly defined ineffective property rights on economic performance. Such an institutional framework result not only in high costs of transactions but also insecure property rights result in using technologies that do not entail long term agreements. Mundane problems such as the inability to get spare parts or a two-year wait to get a telephone installed necessitate a different organization of production than compatible with an advanced country. Existence of a bribe culture to get quick delivery through the maze of import controls or get rapid telephone installation complicate transactions costs significantly, alter relative prices and consequently the technology employed. The constraints suggested by North range from constitutions and laws governing economics and politics, and to unwritten taboos, customs, traditions and beliefs. These formal and informal rules and constraints and their enforcement outcomes define the incentives and opportunities of individuals and firms. In an environment with weak institutions, firms typically cannot engage in complex, long-term, and multiple-contracts with effective enforcement. A relatively good property rights structure that encourages long-term contracting is essential for the creation of capital markets and economic growth. Such institutional framework affect growth by affecting both the amount spent on the costs of transactions and the costs of transformation in a production process. For instance, if the property rights or rule of law are not reliable, transaction costs are higher, inducing private firms to typically operate in a small scale and even illegally in an underground economy, relying on corruption to facilitate their operations. Production costs too can be raised substantially because contracts become unenforceable, making firms resort to inexpensive technology and operating less competitively in a short-term horizon. Acemoglu and others subsequently extended from the institutions limited to property rights to offer a more convincing theoretical framework based on the supremacy of political institutions that define the incentives and constraints. They viewed economic institutions as social decisions determining the incentives and the constraints on economic actors which shape economic outcomes. Different groups and individuals typically benefit from different economic institutions. Consequently, there is generally a conflict over these social choices., which is ultimately resolved in favor of groups with greater political power. The distribution of political power in society is in turn determined by political institutions and the distribution of resources. "Political institutions allocate de jure political power, while groups with greater economic power typically possess greater de facto political power. "The latter is intrinsically transitory and, because of the nature of the collective action problem, difficult to wield, thus making political institutions often the choice in creating a source of durable political power. Political institutions determine the constraints on the use of political power and many contingencies. This framework is described as the hierarchy of institutions and path dependence which emphasizes that history, politics, structure of political power, and nature of political institutions can explain why different countries have different economic institutions and subsequently different economic outcomes. An institutional matrix that determines the incentives and opportunities in a given society reflects the ideological or cultural beliefs of those who are in the position to dictate the rule of the games and finally define economic institutions. In other words, economic institutions that establish the rules of games are the results of ideologies, belief and interests of people with political power. Politics and political institutions determine the economic institutions a country ends up with. The different patterns on institutions existing today are deeply rooted in the past. Once a society gets organized in a particular way, it tends to persist. Though institutions are the key to the differences between rich and poor nations, that does not mean that the poorer societies will adopt the institutions that are best for economic growth. This is because other institutions may be even better for those who control political institutions. At the end of the day, what rules a society ends up with is determined by who has power and how their power can be exercised. How a society mobilizes and organizes to effect social change and inclusive growth depends in most instances on the history of economic and political institutions, on many small differences that matter and on the very contingent path of history. Societies resolves the ubiquitous economic and political conflicts in different ways depending on critical historic junctures, the role of individuals, or just random factors. The exact path of the outcomes is not historically predetermined. It depends on which one of the contending forces will be able to form effective coalitions and which leaders will be able to shape events to their advantage. The ecological consequences: The global economy is an industrial economy using energy, mainly in the form of fossil fuels, to turn raw materials, many of them non-renewable, into useful goods and services, many of which end up in landfills. The world economy requires about 90 million barrels of liquid fuels each day, and about 600 million tons of steel every year. Cement production in 2016 stood at around one hundred million metric tons. About fifty thousand square kilometers of arable land are lost each year to soil degradation, largely from industrial agricultural practices. Deforestation around the earth occurs at the rate of about an acre per second, round the clock, three hundred and sixty-five days a year. The global economy needs forest products, and it needs the land to grow food and biofuels, or to locate new housing developments. Our ecological destruction occurs because the consumer goods that we use, and demand require this output of materials. Americans are the worst offenders as they consume at a rate about six times the global average. It is true that some of this material is renewable, like timber and grain, and some of it can be recycled, but only with considerable inputs of energy. And then, of course, there are the non-renewable materials, especially oil, coal, and natural gas, which are finite in quantity and at the cusp of going into permanent decline in terms of the amount retrievable every year. Their replacement by wind and solar, which require their own natural resources, is overstated and not likely to occur nearly as quickly as hoped nor as completely as expected. Since the early 1970s, William Nordhaus has been studying climate change and its economic impact. Nordhaus's path began in 1972 when he wrote a paper that asked "how good are measures of output currently used for evaluating the growth of economic welfare?" and "does the growth process inevitably waste our natural resources?" Nordhaus, like Romer, extended the Solow growth model with an important set of predominantly negative spill-over effects by including the global warming caused by carbon emissions. In 1994, Nordhaus published the now-famous Dynamic Integrated Climate-Economy (DICE) model. This was the first major effort to develop a method of estimating the economic costs of climate change, and one of the first Integrated Assessment Models (IAMs). It aims to measure the impact of environmental degradation on economic growth and to calculate the social cost of carbon, a key metric used by governments to design climate policy. It became one of the main analytical tools used to assess the damage posed by climate change. Nordhaus models have three interacting modules: (i) a carbon-circulation module describing how global CO2 emissions influence CO2 concentration in the atmosphere as they circulate between the atmosphere; the ocean surface and the biosphere; and the deep oceans; (ii) a climate module describing how the atmospheric concentration of CO2 and other greenhouse gases affects the balance of energy flows to and from earth leading to changes in the global energy budget over time and, in turn affecting the time path of global temperature, the key measure of climate change; and (iii) an economic-growth module describing a global market economy that produces goods using capital and labor, along with energy which generates CO2 emissions. This third module describes how different climate policies such as taxes or carbon credits affect the economy and its CO2 emissions. Nordhaus's models produce a time path of GDP, welfare and global CO2 emissions, as well as a time path of the damage caused by climate change. Nordhaus's took on the challenge of examining the feedback loop between human activity and the climate. He understood that nature is a constraint on economic activity, but economic activity is also a constraint on nature. Nordhaus modelled out the global emissions of carbon under four universal policies. The first scenario is a baseline estimate, in which no policies are adopted. In the second scenario, carbon taxes start out at around $30 per metric ton of carbon dioxide and rise over time at about the same rate as global GDP. The third and fourth scenarios show what would happen with carbon taxes six to eight times higher than the "optimal" level-and lead to far more drastic drops in CO2 emissions. This work led Nordhaus to become an early advocate for a universal carbon tax. Coping with the challenges of global warming is a daunting task for both scientists and economists, who must understand future changes, and for policy makers, who must ultimately choose policies to balance risks and costs. One of the major findings in the economics of climate change is that efficient or optimal" economic policies to slow climate change involve modest rates of emissions reductions in the near term, followed by sharp reductions in the medium and long term. These findings have survived the tests of multiple alternative modeling strategies, different climate goals, alternative specifications of the scientific modules, and more than a decade of revisions in integrated assessment models. The logic is straightforward. The highest-return investments today are primarily in tangible, technological, and human capital, including research and development on low-carbon technologies. In the coming decades, damages are predicted to rise relative to output. As that occurs, it becomes efficient to shift investments toward more intensive emissions reductions. The exact mix and timing of emissions reductions depend upon details of costs, damages, and the extent to which climate change and damages are nonlinear and irreversible. There are many perils, costs, and uncertainties-known unknowns as well as unknown unknowns-involved in unchecked climate change. Economic analyses have searched for strategies that will balance the costs of action with the perils of inaction. All economic studies find a case for imposing immediate restraints on greenhouse gas emissions, but the difficult questions are how much and how fast. World governments party to the Paris Agreement requested a comprehensive report on the impacts of 1.5°C of global warming and how best to limit warming. The report, released recently, assessed more than 6,000 scientific papers, with input from 91 authors and editors from 40 countries. It finds that the climate consequences of a 2° world are far greater than that of 1.5° and that the world is not on track for either; limiting warming to 1.5C is barely feasible and every year we delay the window of feasibility halves; and it will be expensive, but the window of opportunity is not yet closed. Climate impacts are already occurring and will be much worse at 2°C than previously projected. That means 2°C is no longer a safe goal to avoid the worst impacts of climate change. Limiting global warming to 1.5°C could reduce the number of people both exposed to climate-related risks and susceptible to poverty by up to several hundred million by 2050 compared with 2°C. Global economic growth faces a greater threat at 2°C of warming vs. 1.5°C. Limiting global warming to 1.5°C would require "rapid and far-reaching" transitions in land, energy, industry, buildings, transport, and cities. These systems transitions are "unprecedented" in terms of scale, but not necessarily in terms of speed. Global warming is likely to reach 1.5°C between 2030 and 2052 if temperatures continue to increase at the current rate. The best path for limiting warming to 1.5°C means reducing carbon pollution by about 45 percent from 2010 levels by 2030 and reaching to net zero by 2050.The report explicitly finds that current Paris Agreement pledges are not enough to limit warming to 1.5°C, and governments need to strengthen national climate policies to limit warming. Nordhaus examined several different approaches to climate-change policy: no controls, economic optimization, geoengineering, stabilization of emissions and climate, and a ten-year delay in undertaking climate-change policies. Among these, there is a modest advantage of an efficient policy over no controls or a ten-year delay, while the three stabilization options would impose significant net costs. Overall, Nordhaus analysis reveals that even with major technological breakthroughs and stringent controls, the momentum of past greenhouse gas emissions coupled with great inertia in climate change policy will lead to an inevitable rendezvous with massive climate change. Nordhaus is very critical of current climate policies. In 2016, he said that the target of not letting global warming exceed 2°C above pre-industrial levels-the goal agreed in the Paris accord-was unlikely to be achieved "even if ambitious policies are introduced in the near term." Instead, "a target of 2.5°C is technically feasible but would require extreme, virtually universal, global policy measures." From theory to policy: The economics profession has changed substantially in thinking about economic growth, international trade, development, economic geography and the environment. In each of these areas, the profession has progressed from simplistic models based on perfect competition and analytically tractable approaches to taking account of key features of production and transaction technologies to explicit recognition of market power and strategic behavior. The effects of this general trend have been far-reaching. It forced economists to reconsider some of the most basic propositions. In every area where economics has changed, evidence that challenged the dominant models had been apparent all along. Who did not know that there was lots of intra-industry trade between developed nations and little between the North and the South. Who doesn't know that some developing countries grew spectacularly while others languished. That people do the things leading to technological change is not rocket science as is the fact that the number of locally available goods is limited by the extent of the market in the city where someone lives and works. By making use of all these evidence, economics has moved beyond conventional wisdom toward a complete understanding of the determinants of long-run economic success. This has better positioned economics to offer policy-makers something more insightful than the standard prescriptions such as more saving and more schooling. The profession has rejoined the ongoing policy debates about subsidies for private research, antitrust exemptions for research joint ventures, the activities of multinational firms, effects of government procurement, the feedback between trade policy and innovation, the limits to protection for intellectual property rights, the links between private firms and universities, the mechanisms for selecting the research areas that receive public support, and the costs and benefits of an explicit government-led technology policy. Nordhaus's research showed that the most efficient remedy for the problems caused by greenhouse gas emissions would be a global scheme of carbon taxes that are uniformly imposed on all countries. This builds upon A.C. Pigou's recommendation that each emitter should pay the societal cost of the damage caused by their emissions via an appropriate price. A global emission trading system can do the same job, if limits on emissions are set low enough to result in a high enough price for carbon. The economics profession still has a long way to go. It has not yet been able to grip fully what the growth prospects for are developing countries and how to address the most important policy questions about sustainable and inclusive growth.The future of growth is unlikely to look like its recent past. The first decade of the 21st century was extraordinarily good for developing countries and their poor citizens. Their economies expanded at unprecedented rates, resulting in both a large reduction in extreme poverty and a significant expansion of the middle class. This growth was led by the efforts of China, India, and a small number of other Asian countries, and assisted by the weaker economic performance of the rich countries. Latin America and Africa resumed growth as well, catching up with the growth rates they experienced during the 1950s and 1960s. As a result, the developing countries moved more quickly to close the income gap with the advanced countries. More recently, however, that process has slowed down, making it unlikely that poorer countries will be able to close the development gap with richer countries anytime soon. A developing country like Bangladesh faces the twin challenges of "structural transformation"of ensuring that resources flow rapidly to the modern economic activities that operate at higher levels of economic productivity and the "fundamentals" challenge of accumulating the skills and broad institutional capabilities needed to generate sustained productivity growth across the entire range of industry and services. There is considerable debate about whether it is primarily the quality of institutions (governance and the business environment) or the level of human capital (education and skills) that drives long-run levels of income. On the surface the two challenges appear too closely linked to be separable. What is desirable policy for growth need not differ based on whether we look at growth from the perspective of facilitating structural transformation or building fundamentals. While there is substantial overlap between the two sets of policies, it is also clear that the two challenges have somewhat different strategic implications. It may be far easier in practice to promote industrialization directly by removing specific obstacles than to promote it indirectly by making broad investments in human capital and institutions and hoping that these will trickle down to investment incentives in industry. It is possible to have rapid industrialization without significant improvements in fundamentals. Bangladesh's stellar success in garments is a case in point. In China, governance and human capital have lagged significantly behind the country's manufacturing prowess. Vietnam is a similar case, following on China's footsteps with some lag. However, even in the best of all worlds, structural transformation will eventually run its course and reach its limits. It is also possible to invest significantly in fundamentals without achieving much structural transformation. Latin America has considerably improved its governance and macroeconomic fundamentals since the early 90s, yet structural change in the region has most likely been growth reducing. The distinction between structural transformation and the fundamentals helps clarify one of the puzzling aspects of cross-country data: institutional quality and human capital are both highly correlated with income levels, yet improvements in institutions and human capital are not a reliable predictor of economic growth. Only countries that steadily enhance their fundamental capabilities eventually become rich. But investment in fundamentals is not the quickest or easiest way of getting there, at least during the nascent stages of development. It is rapid industrialization that fuels growth early on, requiring policies that may differ considerably from conventional fundamentals. Countries relying exclusively on building up broad-based capabilities are rewarded with modest growth and may in fact be diverted from those policies as a result. Who should emphasize what under which circumstances? What are the best institutional arrangements for encouraging the production, diffusion and use of new knowledge without leaving anyone behind? What is needed for mobilizing the collective will to finance the production of global public good such as reduction of carbon emissions to limit global warming? What reforms globally can address the shortfall between the demand and supply of adequate global governance? The search for these answers is what makes it hard to think about anything else. The author is an economist.